What strategies should LTPAC Medical Groups use as waves of change sweep through our environment? These disruptions include major Mergers & Acquisitions, and market entry by new Acute Care based groups trying to manage patient risk under BPCI. This Blog covers our current recommendations for assessing short & long term risks. The waves of change set off by passage of the Patient Protection and Affordable Care Act (PPACA) are hitting Post-Acute Care and LTC Medicine head-on. August 4th dawned with the news that Team Health (NYSE: TMH) was purchasing IPC Healthcare (NASDA – IPCM) for $1.6 Billion cash. IPC is currently the largest single employer of Hospitalists and LTPAC Medical Staff in the country. Team Health’s existing business model is largely built on staffing Hospital Emergency Departments. In the spirit of full disclosure, I read the press release with considerable interest; my own LTPAC Medical Group was purchased by IPC in the middle of June. A primary motivator for us accepting IPC’s proposal was the combination of our average age, and that age’s effect on investment risk. We’ve struggled with analysis and quantification of that risk for the past 18 months. The balance of this blog focuses on helping practices understand the changing risk considerations in Long-Term and Post-Acute Care Medicine. At the beginning of July, IPC launched its own Model 2 BPCI (Bundled Payments for Care Improvement) program. Hospital-based physicians who admit patients can ‘initiate’ Model 2 bundled payments for a basket of DRGs. IPC Management predicted they’d manage nearly $1.5 Billion of risk for Medicare patients admitted to acute care by its Hospitalists. Other medical specialties, particularly Orthopedics, are taking risk for a smaller basket of DRGs. How these initiatives translate into an articulated Post-Acute Care strategy is still evolving. We do know that only a medical group with access to the largest capital markets (e.g. Wall Street) could safely assume risks of that magnitude. BPCI is not new; the 1st awards under this CMS Innovation Center program were announced in January 2013. The CMS, apparently, was pleased with the savings from those earlier years of the BPCI programs. They published a proposed regulation on July 14th which mandates BPCI for lower extremity joint replacements (LEJRs) in 75 Acute Care Hospital markets. The affected hospitals will receive interim payments based on traditional DRGs for each episode of care. At the end of each year, there is a settling-up process. Depending on a combination of quality measures, and total costs for the 90-day episodes, the hospital receives a ‘bonus’, or must repay part of Medicare’s payments. The only thing that’s certain – Medicare’s total aggregate cost for this patient population will be lower. Implications for PAC Medical Groups – The patients of LTPAC Medical Groups are ‘high cost’ by any analysis. Many Medicare Innovation Programs associate patients with Medical Groups via an Attribution process. The attribution process associates patients with the group medical practice that provides the plurality of primary care to the individual. All healthcare expenditures during a calendar year incurred by that individual are assigned to the medical group (costs might include DME, therapy, specialists, ambulance, ER visits, etc.Additionally, 100% of the patients entering care via a SNF stay have a prior hospitalization, and the added cost of an SNF episode. Let’s face it, most people don’t do very well with statistics. It’s easy to confuse correlation with causality. Most observers, including CMS, assume that LTC Medical Groups have some responsibility for the high costs of patients attributed to them. This is fallacious. I don’t believe LTC Medical Groups have any meaningful control over the total costs of care for patients in SNF episodes of care that are attributed to them. The cost of a hospital episode and the referral/admission to the SNF are facts. The Medical Group’s real role in cost savings for these patients is to diagnose problems early and treat in place avoiding rehospitalization. However, this argument isn’t going to satisfy any Hospital, or Acute Care Medical Group, that is newly liable for the bundled cost of a 90-Day episode of care. LTPAC Medical Groups need to appreciate the ‘help’ we are going to receive from everyone newly interested in our patient population. The result – there are new Acute Care oriented PAC programs springing up across the country. We know LTPAC groups with years of successful care at LTC facilities that are unceremoniously booted from a building because a Part A bundler wants a new medical team. Part A patient referrals may stay the same as more costly IRF (inpatient rehabilitation facility) episodes of care are shunted to SNFs, but the overall days of care will drop. In some markets this drop is going to be Steep as strict PAC Care Paths proliferate. The costs associated with caring for the PAC patient will increase (more coordination at admit & discharge), while fee-for-service revenue opportunities will decrease (secondary to fewer days of care). Physician services aren’t the target for costs savings, simply a victim of collateral damage. Accept the change – it’s temporary. Working in LTPAC Medicine is a calling, not a sideline. Post-Acute patient care may be similar to Acute Care Facility services, but 80+% of the census at the typical nursing facility are LTC patients. Those ‘excess days’ of PAC will evaporate and care paths will approach standardization. The economics of following this population from Acute to Post-Acute will become unsustainable and care arrangements will revert to something like the current markets. The entire building needs care, not just the PAC population. What to do during the interim? We’ve always believed that the key for success in LTPAC Medicine was an intentional focus on the compassionate, and clinically appropriate, care of a facility’s long term resident population. Those are the permanent citizens populating LTC settings. In terms of public spending (Medicare + Medicaid) how we care for, and care manage, these individuals says more about us than prevention and intervention put together. This is the population with impaired decision making skills. If your medical group has (or develops) effective care management programs that balance compassion, effectiveness, and expenses, the future is bright. Look for LTC Risk Partners. Neither ACOs, current MSSPs, MIPS, nor BPCI programs are going to reduce the cost of serving the LTC population. That will take a different entity – something akin to ISNPs (Institutional Special Needs Programs a/k/a Medicare Advantage for LTC residents). For reasons beyond this blog’s scope, LTC Medical Groups are the most logical vehicles to share risk for managing the LTC population. While few LTC Groups have the financial capability or skills to directly accept the full economic risk for these programs, they can create the delivery system. Identifying risk sharing partners will become a key strategy for groups (this is what IPC did with their BPCI program). Changes in our markets (we ultimately grew to covering parts of 8 different health systems – which became a challenge to efficiently navigate). Changes in Regulations (not just Part B, but for nursing facilities and other providers) pose an increasingly difficult challenge to communicate to our growing team of clinicians. The duration of FFS payment rates & penalties secondary to changes in legislation, VBP and MIPS are rapidly changing and warrant following closely. For example, in 2015, Medicaid Parity Payments for Primary Care Physicians ended as a PPACA requirement. Some States continued with Parity payments, others fell back to their Medicaid rate tables. How long did we project each revenue adjustment (+ or -) to continue? Each of those factors, and a host of lesser items, contributed to our overall assessment. Medical Practices, as with any other business have inherent risk and potential value to other organizations. We recommend that current LTPAC Medical Practices, or anyone considering entering the market perform a strategic assessment. For our own practice, the most recent assessments showed an interesting risk ‘inversion’ occurring. The current and near term changes in Medicare payments, and the disruption caused by BPCI created a steep up-tick in financial risk. Simultaneously, our practice’s strategy for population management boded well for the long term. In the final analysis, age became our deciding factor. The average ages of our partners augured against a strategy that might require 5 years to pay-off. These are the kinds of risk/reward analyses that every provider should perform. In my opinion, the next few years will present short-term challenges to LTPAC Medicine as regional markets realign around BPCI. The longer range (3-5 year) forecast for LTPAC practices is very exciting. The opportunity to make meaningful contributions to improving the quality of care, and reducing the overall cost of treatment via reducing hospitalizations is outstanding. 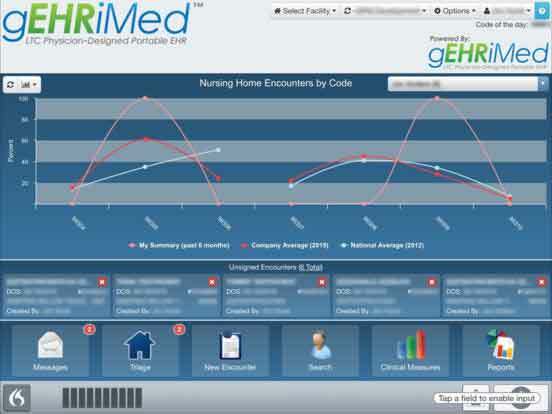 While the responsibility for my own LTC Medical Group now rests with larger organizations, we remain fully committed to our strategy for developing and expanding gEHRiMed, our EHR solution for LTPAC medicine. Postscript: Just prior to publishing this blog, I read a post in the Health Affairs Blog titled ’Reinventing Home Health ’by John Marchica. Read his post and you’ll see how closely the effects of value based reimbursement mirror themselves across the home and facility based arenas.